Energy cost for keeping fresh seafood in cold condition is a main feature of a fresh seafood delivery routing problem. In the delivery routing problem, energy cost varies during the transportation process and the service process. In addition, there are many fresh seafood product factories whose seafood products should be delivered to a set of customers. Therefore, this paper models the fresh seafood delivery problem as a multi-depot vehicle routing problem, which aims to find the routes with the least cost. 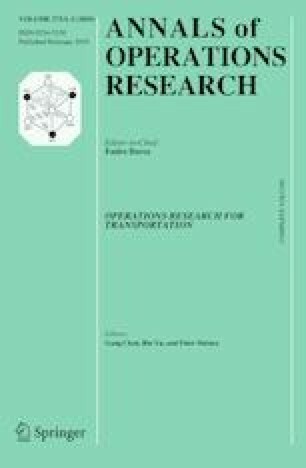 Due to the complexity of the problem, a method is used to reduce the complexity by changing the multi-depot vehicle routing problem into a vehicle routing problem with a dummy depot in this paper. Then, ant colony optimization (ACO) is used to solve this problem. Scanning strategy and crossover operation are also adopted to improve the performance of ACO. At last, the computational results of the benchmark problems of the multi-depot vehicle routing problem indicate the effectiveness of the algorithm. Furthermore, the real-life fresh seafood delivery routing problem from Dalian city suggests the proposed model is feasible. This work was supported in National Natural Science Foundation of China 51578112, 51208079 and 71571026, and the Fundamental Research Funds for the Central Universities DUT16YQ104.